Come and see the Sleeping Giant of Arden Road! A Sleeping Giant is about to be revealed to the Public on Arden Road in Courtenay! 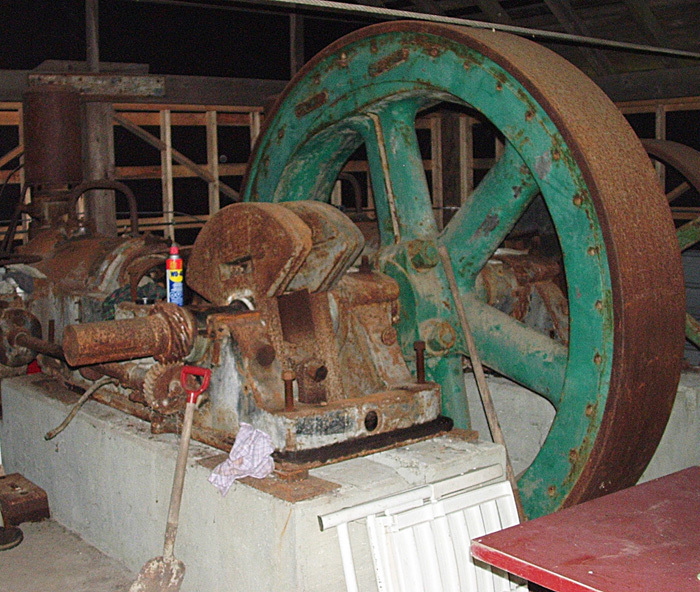 On Saturday, July 8th , between 2.00 pm and 5.00 pm, the Glacier Heritage Power and Equipment Club (GHPEC) will be showing off the Club’s Restoration Project, a mighty Crossley Oil Engine which powered a gravel works near Cumberland until the company was connected to Hydro. Everything about the Crossley, a fine example of British engineering built in 1928, is impressively large. It only has two cylinders but they are 12” bore and 22” stroke, set in separate cast iron engine beds on either side of a massive flywheel that is 8’ 6” in diameter by 16” wide. In effect, it is two separate engines with a common flywheel and indeed, single cylinder versions were available. The total weight is 13 tons! It was designed to run on unrefined oil if diesel fuel was not available and would happily consume used sump oil, as long as the gritty bits had been filtered out. The power output was between 116 and 132 HP, depending on the fuel, at an operating speed of 257 RPM and it could run at full load for days on end. Although the basic operating principle is the same as modern engines, the physical layout is very different. For a start, the two cylinders are horizontal instead of vertical and most of the working parts are exposed to view. It has no enclosed crankcases, just light sheet steel covers over the crankshaft to stop oil splashing about and would run just fine without them, so the pistons could be seen going in and out of the cylinders. It has exposed rotating shafts at the side of the engine beds that drive the governor, fuel pumps and the valve gear. The valves are operated by long rocking levers driven by cams on the side shafts and, due to the low running speed of this type of engine, the whole mechanism could be observed operating while the engine ran. The effect is almost hypnotic on a running engine and people tend to just stand and watch for a long time, from a safe distance of course. These big engines are surprisingly quiet in operation, due to the large amount of cast iron around the cylinder bores and the low speed of rotation and it is possible to carry on a conversation near one without having to shout. Unfortunately, this particular engine will not be running any time soon as there is a lot of work to be done to set it up and to repair the deterioration since it last ran. After the engine was retired, some time in the late 1960s, the walls of the engine house were removed so the engine was open to the public, wind blown sand and the weather, none of which did it any good. Grit and water got in everywhere and all the copper fuel and lubricating oil pipes were stolen. In 2004, a road construction scheme meant that the engine had to be moved and it was re-erected complete with its shed at the Tarling Machinery Park on Arden Road, with the help of many generous donors. Although it was placed on a concrete foundation that matched the original, it has not yet been fastened down properly, which has to be done before the engine can be dismantled enough to assess the condition of some of the parts. The Crossley has now been partly dismantled but still looks very impressive as all the major parts are still in place. As it takes up most of the Engine House, it is difficult to take photographs of it that really do it justice and convey the size of it so the best way to experience it is in person. So, if you are interested in old machines and big engines or would even like to help restore our Sleeping Giant to health, come along to the Engine House at Tarling Machinery Park on Arden Road on Saturday, July 8th, between 2.00 pm and 5.00 pm. If you’re heading away from the school on Lake Trail Road, turn left onto Arden Road and shortly after, turn left again under a tall archway built of old Hydro poles, which is the entrance to the Machinery Park. Admission is free and refreshments will be available on site. We hope to have a few other old machines on display too. If you would like any further information about the Crossley or the Club or if you have a business and would like to get involved with the restoration project in some way, please contact Jim Webb on 250-337-5337, otherwise, just turn up on Saturday to see our Giant. 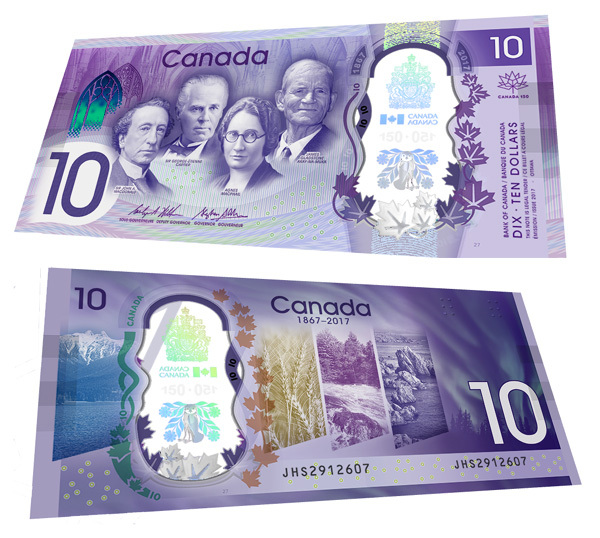 A new $10 bill has been produced to commemorate Canada’s sesquicentennial. A round of phone calls to several banks in the Valley has confirmed that some bills have arrived and are no doubt winging their way into general circulation at this very moment. If you’re interested in finding out more about the meaning and history behind the design, check out this link to the Bank of Canada webpage. Photo credit: The celebrated wedding between fashionable young couple Harry Simms and Janet Graham. Left to right: Janet Graham, Harry Simms, Blanche Dando, Tom Simms. 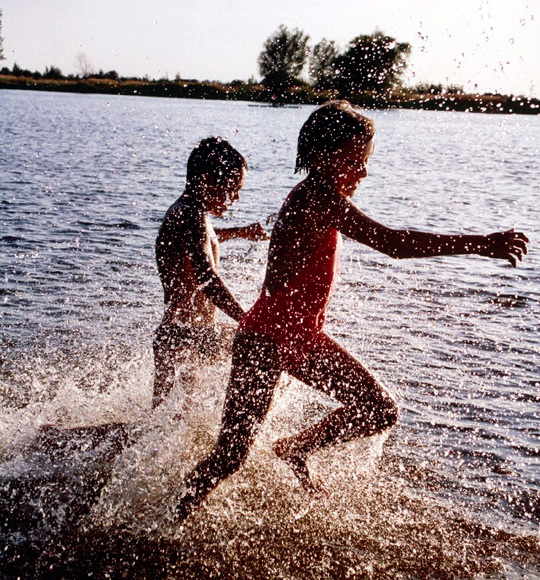 Charles Sillence photograph. Page 162-163. Photo caption: “Elaborate details of weddings were features of community newspapers. 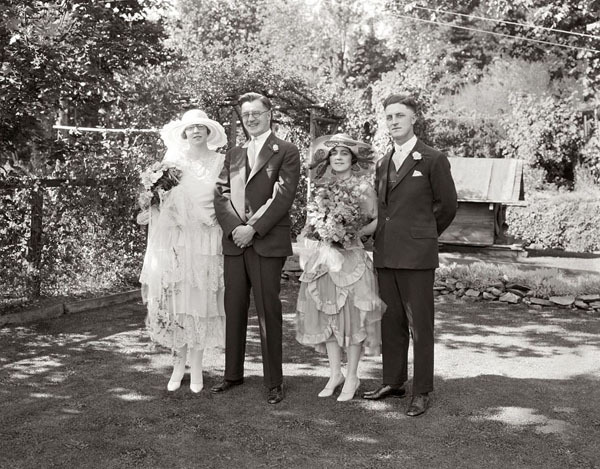 When Janet Eade Graham married Henry Charles (Harry) Simms on September 4, 1929, two prominent Comox Valley families joined. Thomas Graham, the bride’s father, was the senior superintendent of Canadian Collieries in Cumberland, and Charles Simms, the groom’s father, had been mayor of Courtenay.” Page 160. Our exciting gift shop expansion has also expanded our merchandise selection! There are many new items to discover: everything from an up-dated design of elasmosaur baseball hats to t-rex mugs to stuffie gnomlins. We continue to feature locally crafted gift items including some from Knotty Handmade Creations of Royston. This clever company has a wide variety of old fashioned cotton knit dish cloths, flower scrubbies and pot holders. The cheerful designs include fruit, cats, and starfish in fun, upbeat colours. Knotty Handmade Creations also produces finger puppets and we’re carrying unicorns, octopus, dinosaurs and even elasmosaurs! Ding Ding Dillio Crafts of Courtenay has come up with yet another ingenious idea – this time it’s dinosaur hoodies. These brightly coloured hoodies are perfect to wear for a cool evening and are great for any dinosaur fan. These are just a few of our new stock selections – make sure to come by and check out our other new additions soon. 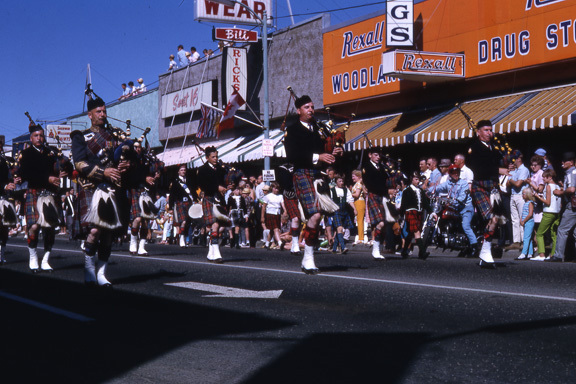 Bagpipers galore in front of the old Rexall Drugs on Fifth Street, courtesy of George Law. 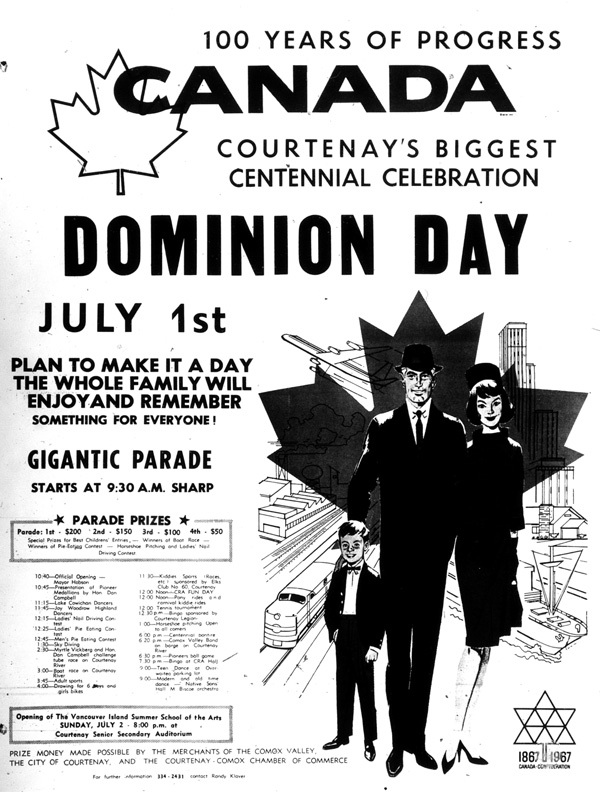 The Valley celebrated Canada’s 1967 centennial in style with several events along the Courtenay River. Take a look at this listing from the June 14, 1967 Comox District Free Press – you’ll never believe what was planned for a river barge! Everyone is invited to the museum’s annual open house! 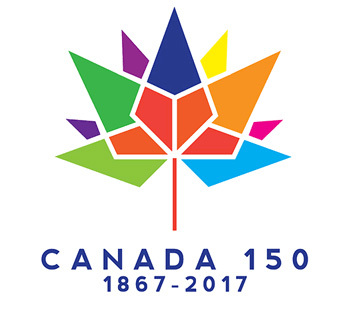 While you’re here, take a few moments to check out our expanded exhibits “Pacific Connections” and “Itineraries” which were created in honour of Canada’s 150th birthday. We’ve got activities and surprises planned for the big day so be sure to drop by. 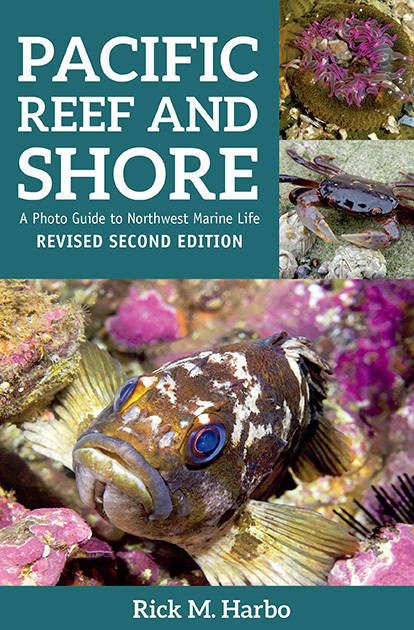 Just in time for beach season, biologist Rick Harbo presents a colourful talk and slide show on Pacific marine life.